“October will be rainy.” That was one of the main headlines I understood as I read the morning addition of 24 Hodin, a newspaper produced daily here in Prague. One of my morning regulars, as we commute to language class, is picking up this free newspaper from the lady at StaromÃ©stka metro station. It has been fun speaking my bad Czech to her telling her that she is helping me learn as I attempt to read this newspaper every morning on my tram ride to school. Anyway, I really didn’t need to read this in a newspaper to tell you this. 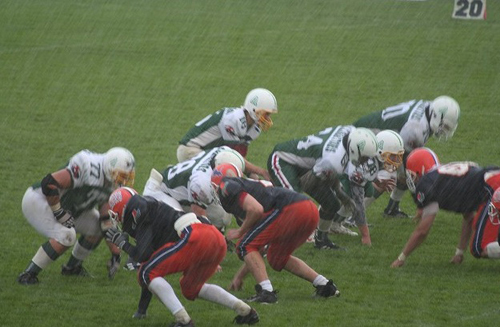 Last week our junior team (I coach the skill positions), played Brno home and we got dumped on (see the pic below). Let’s just say I’ve learned words like deÅ¡tivÃ½ (rainy), mokrÃ½ (wet), suchÃ½ (dry) and more in very, very practical ways as of late. I’m grateful that my dad bought me some rain gear right before I left the States. I just got it because I didn’t have any, but my trusty orange Columbia rain jacket has become my most prized possession thus far. Thanks Dad! Okay, I need to get some time with God, work on my prayer letter (sorry its late), and maybe right some thank yous. Blessings to you this Saturday!